The Palace of Westminster was originally laid out for Edward the Confessor. It still officially remains a royal palace and is a former residence of kings. 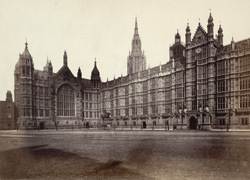 The present building was designed and built by Charles Barry and Augustus Pugin (1837-1847) to house parliament. "This Photograph embraces a large angle of view and presents a strikingly picturesque appearance. To the left is the South Gable of Westminster Hall, with its fine old window (which is of stained glass), representing the arms of the various sovereigns from the time of the conquest. The equestrian statue represents Richard, Coeur de Lion. The magnificent Lantern Tower occupies the centre of the building, the lower part of which forms the Central Hall, and the upper portion is used as an air shaft for the ventilation of the whole building. To the right is the Peers' Entrance, a very massive and ornamental Porch with stone groining."